1. Use a ton of water. 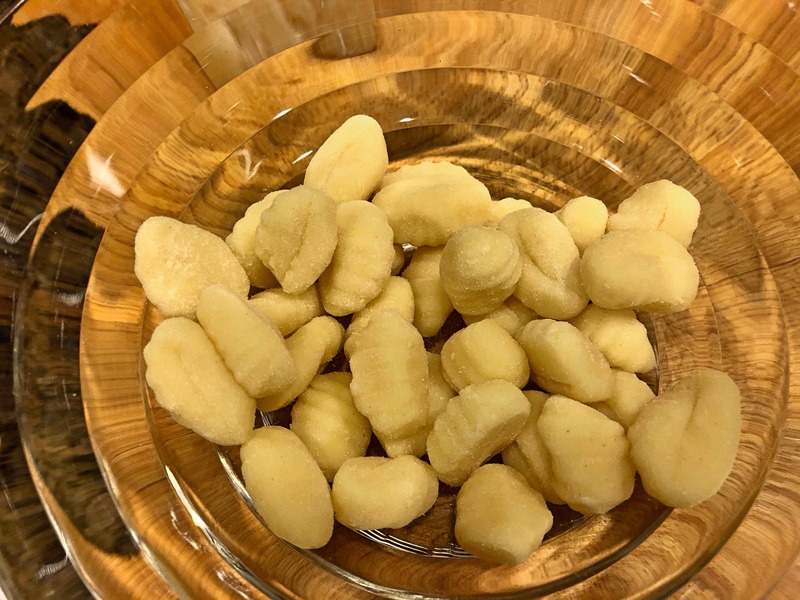 Even more so than pasta, gnocchi like to float and be free. 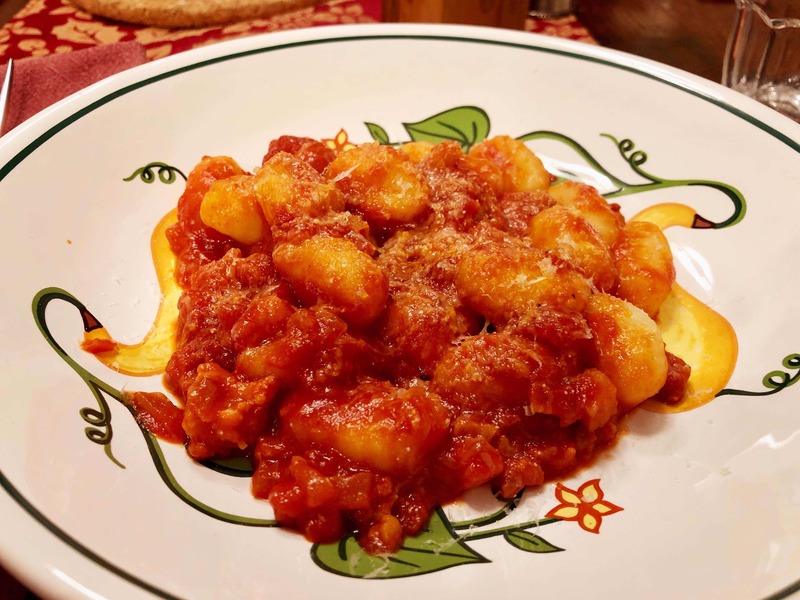 If the pot is too small, the gnocchi will stick together and become starchy and heavy. 2. Don’t abuse them. When the gnocchi are done, do not drain them to a colander. Remove them from the water with a slotted spoon and transfer them directly to the sauce. 3. Serve immediately. 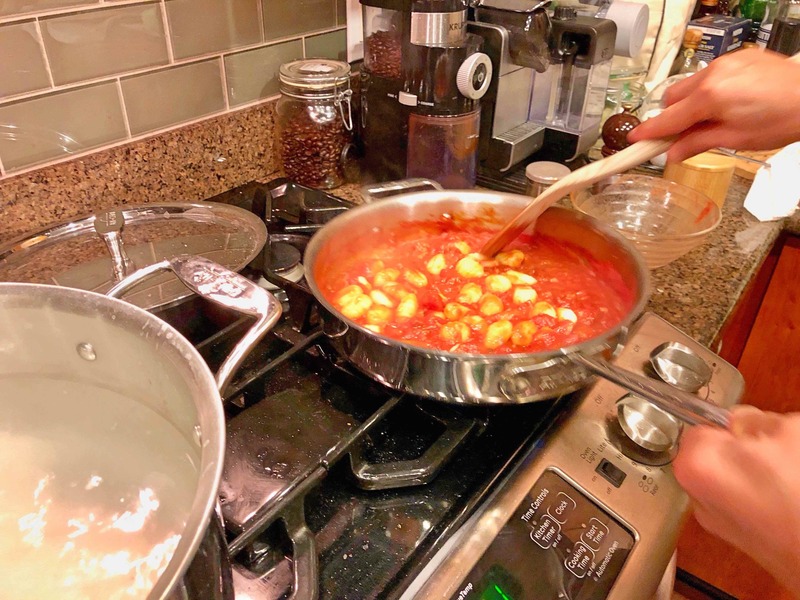 Once the gnocchi are transferred to the sauce, stir them gently for a minute or two. . .They cannot be held on the stove or they will toughen. I might add one additional key to John’s. 4. Separate the gnocchi. When removing them from the package, make sure that none are stuck together. I’m happy to report that my faith in John was not misplaced. 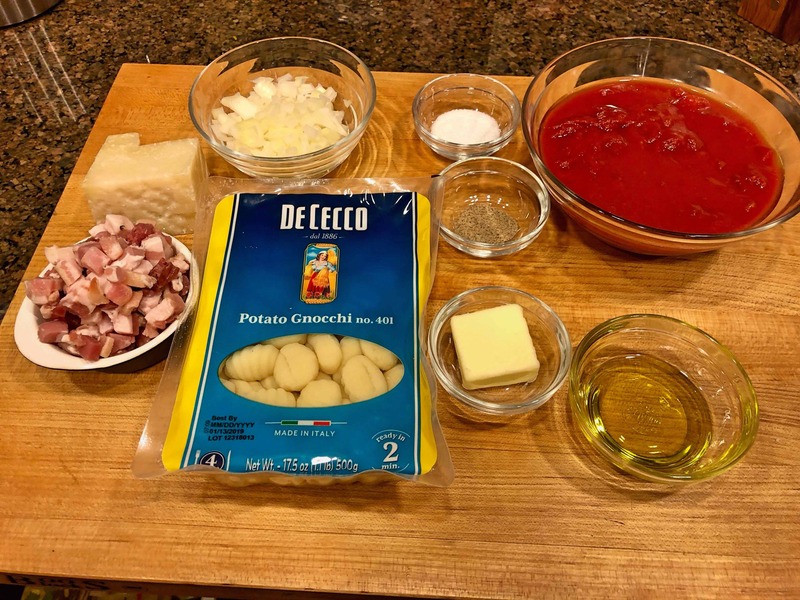 Thanks to his advice, the gnocchi turned out far better than I had expected and this product has found a place in my pantry. As I was cooking for two, I modified John’s recipe by halving the ingredients. I also substituted butter for light cream and a yellow onion for a Vidalia. Finally, I also reversed the order of cooking the pancetta and the onion, preferring to sauté the onion in some of the pancetta’s rendered fat. 1.) In a sauté pan large enough to hold the gnocchi, warm the olive oil over medium heat. 2.) Add the pancetta and slowly render the fat but don’t allow the pancetta to get crispy, approximately 3 to 4 minutes. 3.) 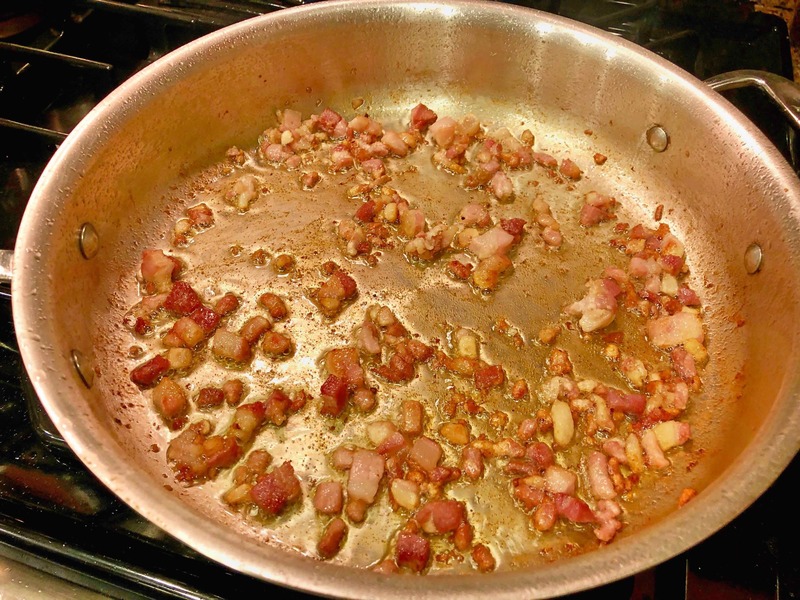 With a slotted spoon, remove the pancetta from the pan. Drain all but 2 tablespoons of the remaining fat from the pan. 4.) 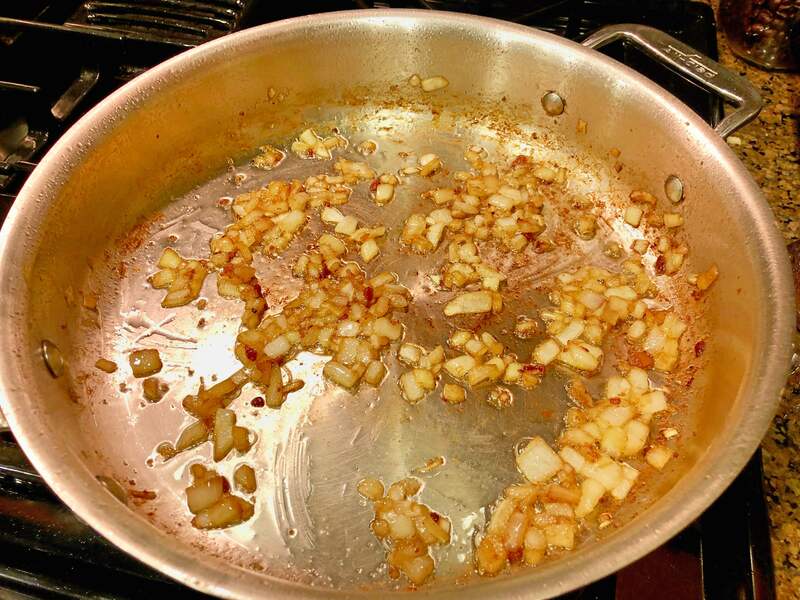 Add the onion and sauté over medium heat until soft and lightly golden, but not brown, approximately 5 minutes. 5.) Add the tomatoes, the cooked pancetta, salt and pepper. Be careful not to add too much salt at this point. 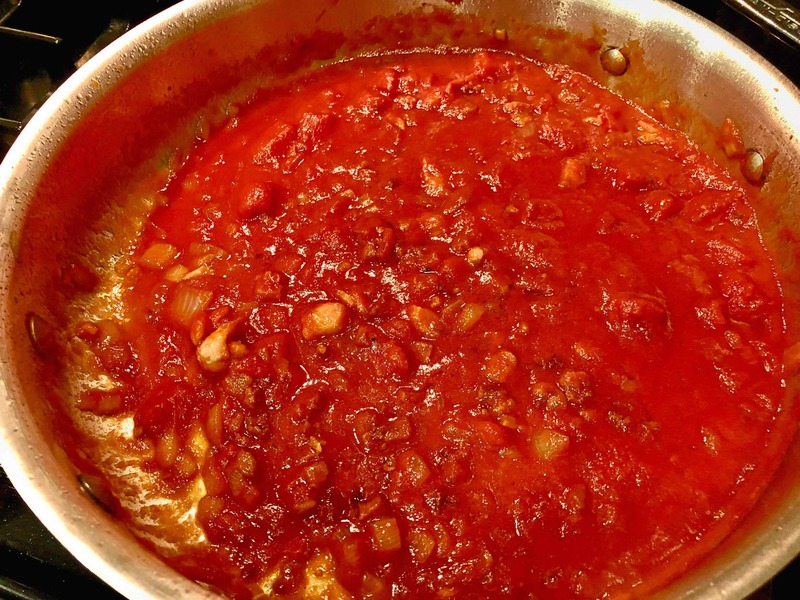 Reduce the flame to low and simmer the tomatoes for 15 to 20 minutes. 6.) After the sauce has cooked, add the butter and check for seasoning. 7.) Meanwhile bring a large pot of water to a boil. Add salt and cook the gnocchi. When you add the gnocchi, they will fall to the bottom of the pot. Stir gently with a wooden spoon. 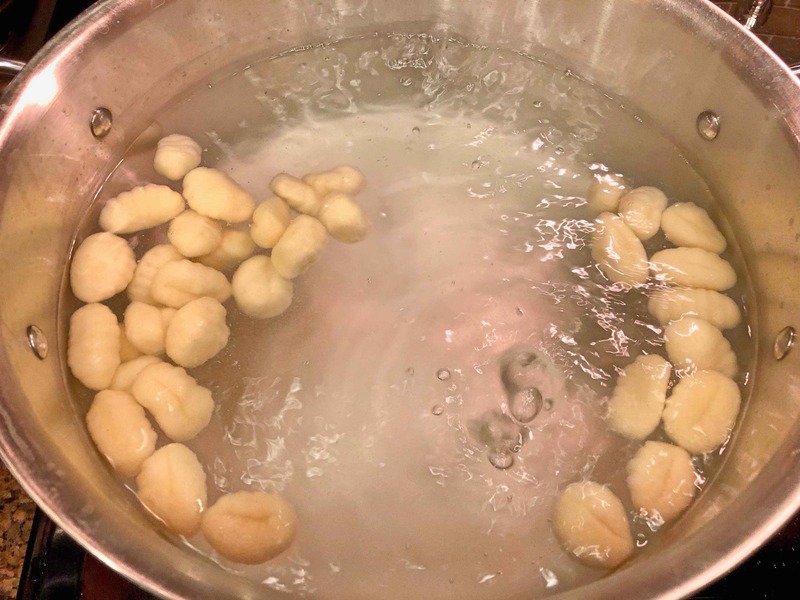 When the gnocchi are done, they will float to the top of the pot. 8.) 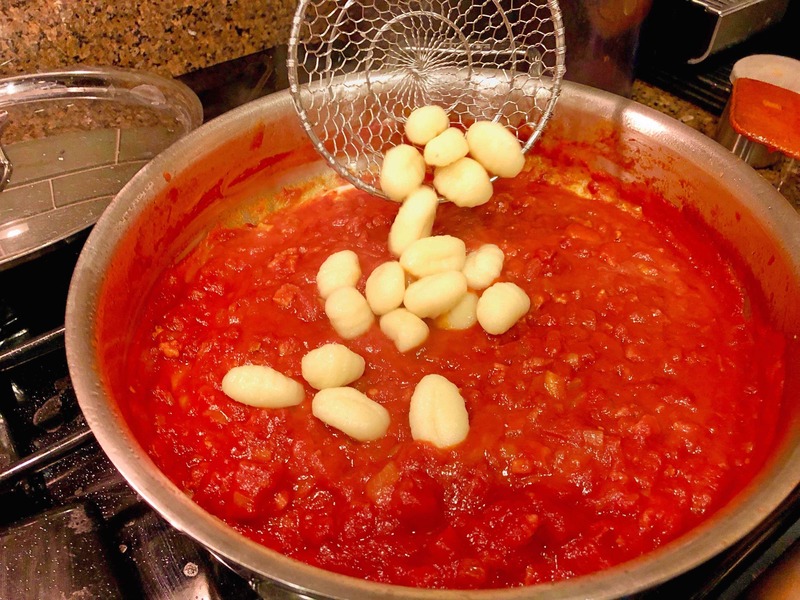 When the gnocchi are done, using a spider or slotted spoon transfer them directly to the warm sauce. Do not drain them in a colander. 9.) 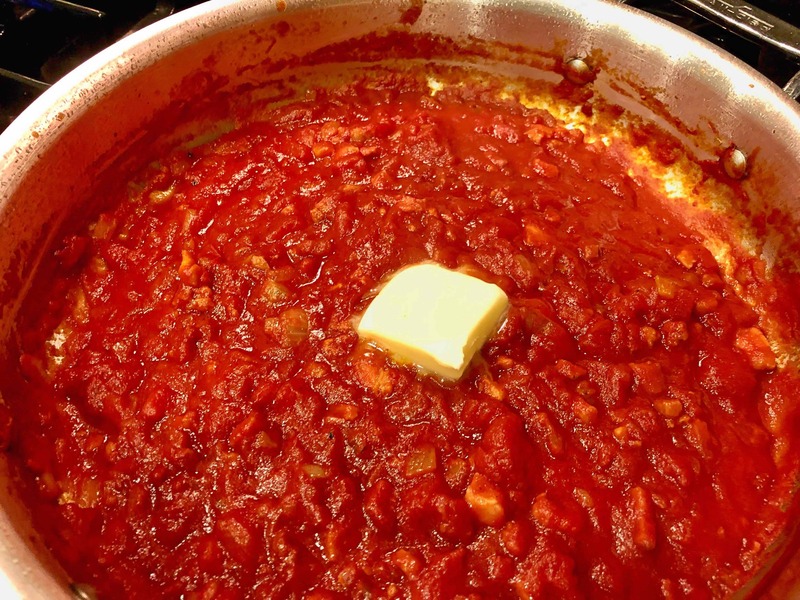 If the sauce is too thick, add a little pasta water to the pan. 10.) 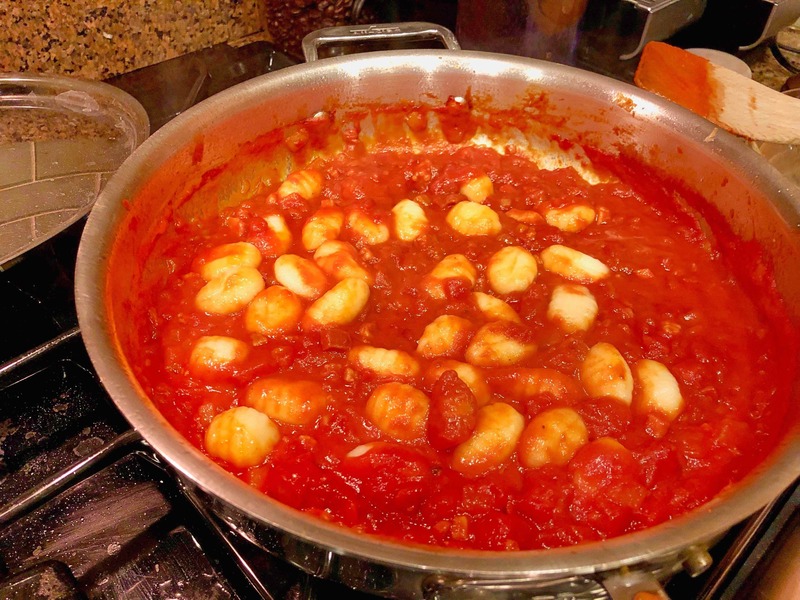 Over the lowest heat, gently stir the gnocchi for a minute or two to coat them with the sauce. Then serve immediately. If held too long, the gnocchi will toughen. Sprinkle cheese and a little basil. Ciao Rolando! Grazie mille and I’m glad you liked these. I will agree with you too that separating the gnocchi is important. I do that all the time but didn’t think to mention it. I keep these around because the kids love them and I often make them as a side dish instead of potatoes. They come out Nicole t with butter, cheese and pepper Cacio e Pepe style or even with D’artagnan truffle butter to finish. Buon Natale to you and yours my friend! You’re welcome; will prepare the 1/2 pound I have left over with sage and butter. Really a nice find.